The Ego LV1 isn’t just another version of the popular Ego paintball gun, it is a revolutionary new design that pushes the possibilities of a poppet style marker. The LV1 incorporates a cam-shaped lever between the rammer and the exhaust valve. It separates the action of the rammer from the action of the valve. This new element in the mechanism reduces the amount of force required to open the valve and the rate at which the valve is opened. The indirect operation of the exhaust valve means it can be opened slower, with less force, yet maintain seal integrity–something that has blighted other balanced valve systems. Simply put, the lever valve design reduces recoil in the Ego LV1 and allows for finer control of the firing sequence. 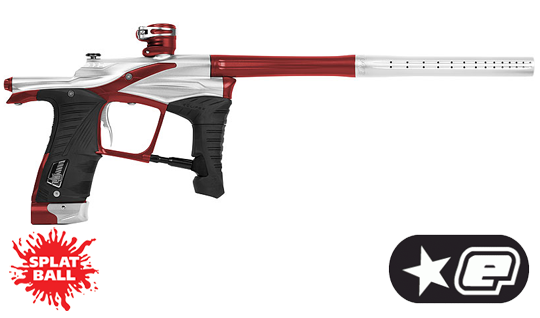 Also new to the Ego LV1 paintball marker is the AT (air transfer) Pipe system. The AT Pipe system does away with the macroline and fittings commonly found in other paintball guns. The new design keeps the overall height of the Ego LV1 to a minimum, resulting in a smaller, lighter paintball gun. It also puts the shooter’s trigger hand closer to the barrel axis and streamlines the airflow into the marker. Of course, the lever operated valve is only one of the innovations in the Ego LV1 paintball marker, there are many more improvements throughout the entire marker; front to back; inside and out. For example the exhaust valve itself is a completely new design: from the profile of the “onion bulb” valve to the fully sheathed valve spring, the goal is to provide a path that is as smooth as possible, leading up to and through the valve, in order to reduce turbulence and allow the air to flow and work as efficiently as possible. The exhaust valve and valve guide also incorporate a very large post-release sensing surface area that is tuned to complement the lever mechanism and the forces generated by the reciprocating parts. This works to shut the valve off quickly after each shot so that the excellent efficiency that users expect from a poppet valve marker is retained. The vast increase in valve chamber volume that the Ego LV1 paintball marker offers over previous Egos further aids this feature and helps lower the overall operating pressure of this marker. The Planet Eclipse experience doesn’t stop the moment you take the gun out of the box. From the very beginning, over twenty years ago, the company has prided itself on training and supporting more technicians, in more countries and attending more events, both at the recreational and the tournament level, than probably any other manufacturer. Every Planet Eclipse marker is designed with durability, simplicity and ease of maintenance at the fore and Planet strives to ensure that its customers never require technical support. However, should the need arise then access to that support is available through virtually every form of communication: from email to social media to forums and telephone as well as through technical classes and qualified technicians in as many places as possible to make sure that Planet Eclipse customers always receive a timely response to their queries or problems. Splatball Paintball Store is Planet Eclipse’s North Central Certified Master Service Center. As a master service center, we’re fully equipped to handle warranty work and repairs for the full line of Planet Eclipse markers. Our airsmiths have been fully trained and certified by Planet Eclipse. Anyone who has had the opportunity to shoot an Ego LV1 will tell you that there has been no compromise in any way with the performance on offer from this marker. Every aspect of the Ego LV1 has been shaped to create the ultimate expression of Eclipse passion, performance and quality. There has never been such a complete and thorough overhaul of the Ego. No stone left unturned in the pursuit of perfection. It has to be felt to be believed.